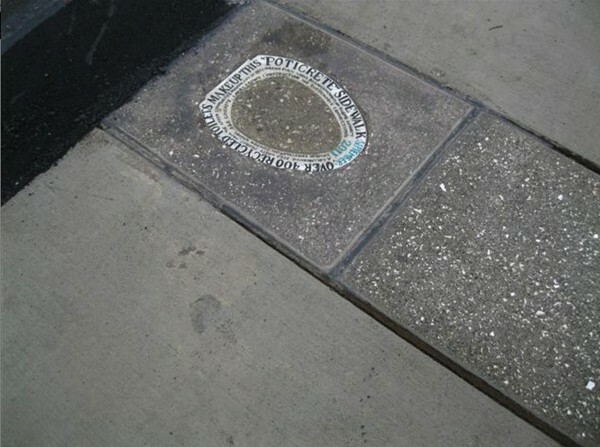 An inscribed toilet seat is embedded into a Bellingham, Wash., sidewalk, making note of the 400 toilets that were crushed and mixed into a new poticrete sidewalk there. 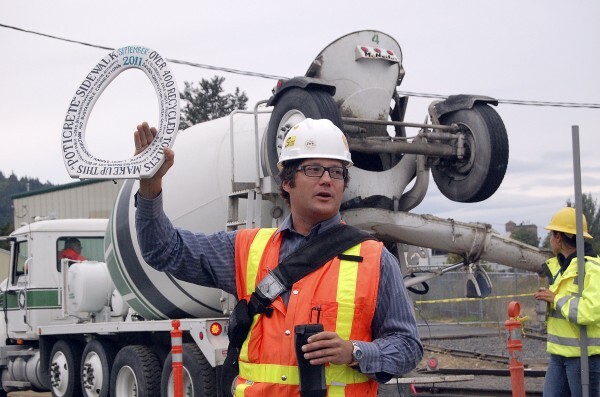 Public works project engineer Freeman Anthony holds up a toilet seat last year that eventually was embedded in a new poticrete section of sidewalk. The sidewalk section was made with an aggregate of approximately 400 crushed recycled porcelain toilets mixed with concrete. 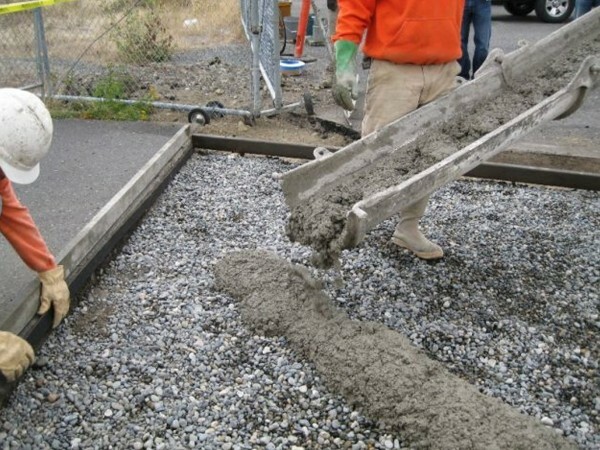 Workers pour the aggregate poticrete on a new trail section in Bellingham, Wash. Some of the 400 toilets travel a conveyor as they are reduced to small chunks of porcelain during the poticrete-making process. 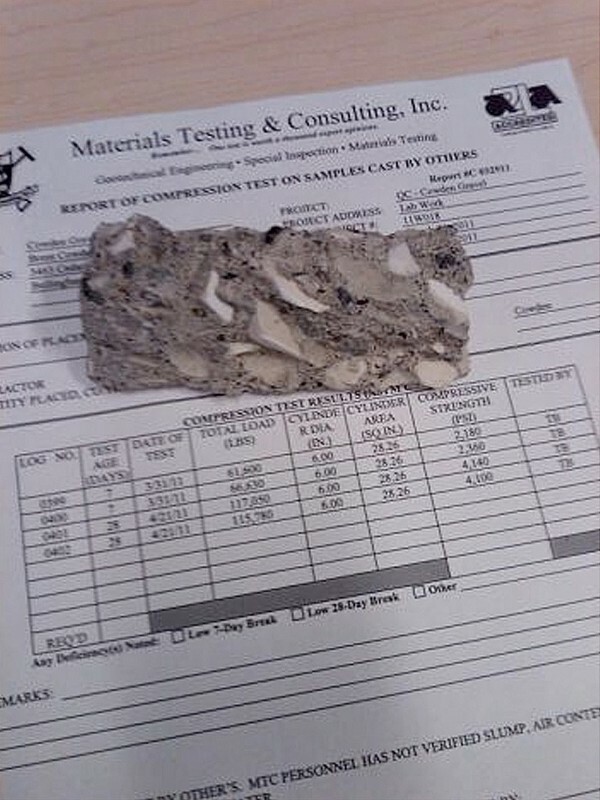 A sample of poticrete, an aggregate of 20 percent crushed toilet porcelain and 80 percent concrete. 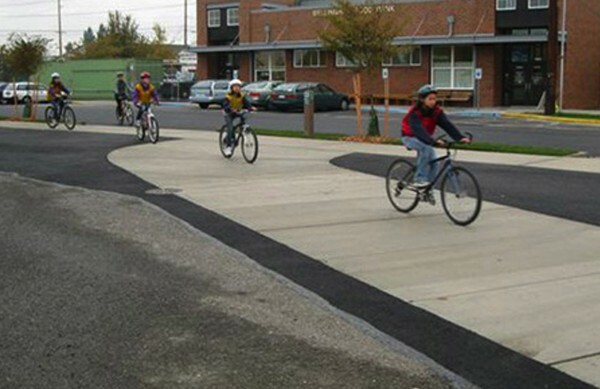 Children in in Bellingham, Wash., ride their bikes over the sidewalk made with an aggregate of concrete and 400 crushed toilets. JACKSON, Maine — When Freeman Anthony was growing up on Common Hill Farm in Jackson in the 1980s, he learned how to do a lot with a little. The 1993 Mount View High School graduate moved to the 80,000-resident West Coast college city several years ago. 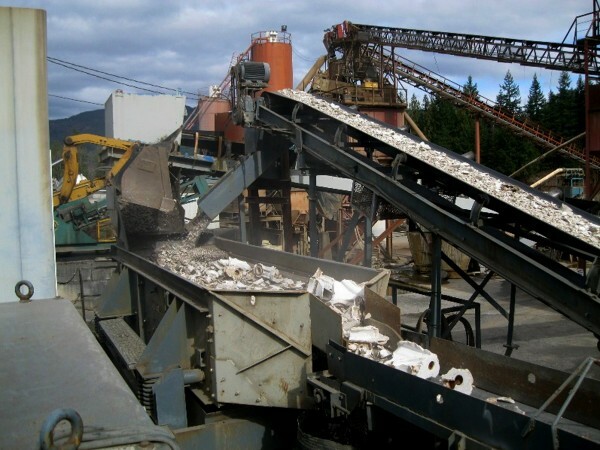 He works for the city of Bellingham, which he describes as having a “strong liberal and environmentally conscious mindset,” and spends much of his time on road rehabilitation projects there. When the Bellingham Housing Authority received a federal grant last year to replace 400 old toilets with water-efficient models, a local nonprofit agency called Sustainable Connections helped get the city to use the leftover loos. That’s where Anthony came in. So the city worked with a concrete supplier to have the toilets crushed up and mixed with sand and cement to create the new construction material. It was a trial and error method at first, he said. “The first batch we used 40 percent crushed toilets. That was a little much. It was a little bony,” he said. But when the mix was made with just 20 percent toilets, it was a different story. “We said, ‘Hey, this is going to work out just fine,’” Anthony recalled. Altogether, the poticrete was used to make about a city block’s worth of sidewalk in the Meador Kansas Ellis Trail project at the edge of downtown Bellingham. While it doesn’t look or feel different, Anthony said, workers ground the edges down on one patch of sidewalk — for educational purposes. “It’s very obvious in one spot. ‘Oh, look, there’s all the little pieces of toilets!’” he said. The $850,000 project, which also improved more sections of sidewalk and road there before its completion last fall, earned the first Greenroads certification at the end of February. The Washington-based Greenroads Foundation, which is active in six or seven states, is aiming to be the “LEED of roadway design,” he said. Leadership in Energy and Environmental Design, or LEED, rates high-performance green buildings around the world. In addition to the poticrete sidewalks, Anthony said that the project included 80 tons of recycled concrete, a variety of different porous surfaces, low-impact stormwater techniques, low-energy lighting and more. “We had enough progressive engineering in this to get certified,” he said. So far, the project has made headlines in Scientific American and the Huffington Post, which Anthony said will help get the word out about this kind of recycling.